Hindi, with over 800 million speakers, is the world's second most widely spoken language and one of only two official lan-guages of India. This essential guide provides businesspeople, travellers, and students with all the words they will need to handle just about any interaction with Hindi speakers. Features: Employs both native Devanagari script and Romanisation; Compact and easy-to-carry size, for added convenience; Over 11,000 total entries. Todd Scudiere holds a master's degree in South Asian studies from the University of Wisconsin-Madison. 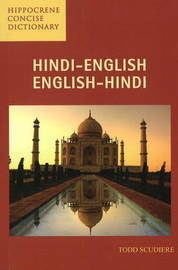 He is a graduate of the American Institute of Indian Studies' Advanced Hindi Lan-guage Program in Varanasi, India. He currently resides in San Diego, California.